A five-judge Constitution Bench is hearing a bunch of 24 petitions challenging the biometrics-linked Unique Identification (UID) number project. 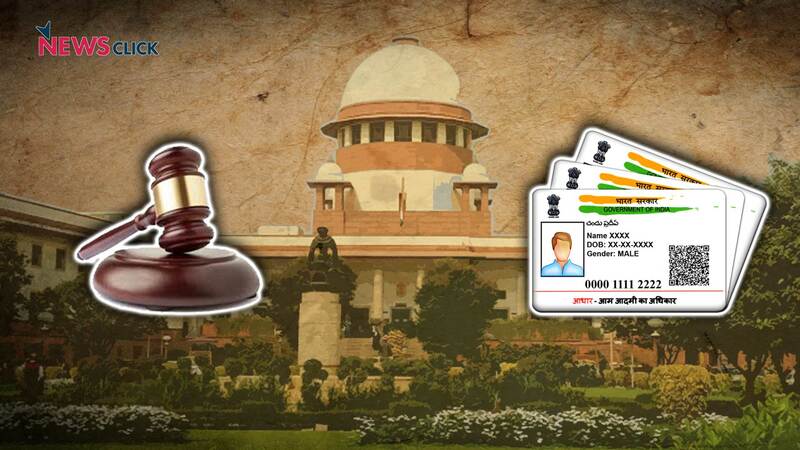 The Supreme Court on 17 January began the final hearings on the constitutional validity of Aadhaar—the biometrics-linked, 12-digit Unique Identification (UID) number project. There are 24 petitions challenging Aadhaar on various grounds—including whether it violates the Fundamental Right to Privacy and against its mandatory linking to all kinds of services and benefits for citizens. The petitioners are led by Karnataka High Court judge K Puttaswamy and social activist Aruna Roy. A five-judge Constitution Bench, headed by Chief Justice of India Dipak Misra, is hearing the petitions. The other judges are Justice DY Chandrachud, Justice AK Sikri, Justice AM Khanwilkar and Justice Ashok Bhushan. Opening on behalf of the petitioners, senior advocate Shyam Divan said Aadhaar “seeks to tether every resident of India to an electronic leash”, which would enable profiling of citizens and surveillance by the State. “This leash is connected to a central data base that is designed to track transactions across the life of the citizen. This record will enable the State to profile citizens, track their movements, assess their habits and silently influence their behavior,” Divan said. Challenging the mandatory linking of Aadhaar to basic services and welfare schemes, Divan pointed out it had become virtually impossible for a citizen to continue without Aadhaar, and it can cause the “civil death” of a citizen. This same five-judge Constitution Bench had passed an interim order on 15 December 2017, extending the central government’s deadlines for all Aadhaar linkings, including the Aadhaar-mobile number linkage, to 31 March 2018. Divan said the government has got a “switch by which it can cause the civil death of an individual”. “Where every basic facility is linked to Aadhaar and one cannot live in society without an Aadhaar number, the switching off of Aadhaar completely destroys the individual,” he said. The senior advocate said citizens must be allowed to produce an alternative identity proof in order to access services and benefits, to which they are entitled to and which they cannot be deprived of because they lack Aadhaar. Divan pointed out the dangerous ramifications and threats to India’s democratic structure if the Aadhaar project was allowed to go ahead the way it is being pushed by the central government. “Over time, the profiling enables the State to stifle dissent and influence political decision making. As the Aadhaar platform extends to private corporations, the degree of tracking and extent of profiling will exponentially increase,” he said. Divan questioned whether the Constitution of India sanctioned the creation of a surveillance state where even routine and regular transactions were being recorded by the State. Divan said Aadhaar altered the relationship between the citizen and the State, while reducing the citizens to “servitude”, which is not what the Constitution of India envisions or mandates. Divan also put forth the demands that people who are already enrolled with the UID programme be given the option to opt out and to delete the data, and that alternative means of identification be allowed to access services and social benefits. “Negatively, nothing can be withheld from a citizen merely because she/he does not have an Aadhaar card or does not wish to use their Aadhaar card,” he said. Divan raised a number of other important questions, including whether the personal liberty and autonomy of Indians extended to biometrics and if they could be asked to use their bodies as markers whenever and wherever demanded. He also questioned whether the Aadhaar Act 2016 was valid as a law, since it had been passed as a Money Bill. Chief Justice Dipak Misra asked whether the Aadhaar Bill was referred to a Standing Committee of Parliament, and Divan replied that it had not. Divan also posed the question whether the evidenced vulnerability of the Aadhaar database — what with regular reports of data breaches and security threats — compromises national security. There were also other questions asked by the judges to the counsel, with Justices AK Sikri and DY Chandrachud wanting to know how the biometrics for Aadhaar was different from the biometrics for getting a US visa. They also asked if petitioners want all data collected between 2009 and 2016 to be destroyed. Justice DY Chandrachud also asked if Aadhaar can be used only for verification or also for tracking back and that if the biometrics was used only for the purpose it was collected for, would that make it okay. The hearing will continue on 18 January. While the Aadhaar project — the brainchild of tech billionaire Nandan Nilekani, which has even been dubbed as “the world's largest mass surveillance project ” — was introduced during the time of the UPA-II, the Modi government has been bulldozing the UID on citizens by making it mandatory for accessing almost each and every service. The final hearing comes five months after a nine-judge Constitution Bench had declared privacy a Fundamental Right on 24 August 2017, protected under Article 21 (protection of life and personal liberty) of the Indian Constitution. The privacy hearings arose in the context of the challenges to Aadhaar.